Do you wish to fight me? After all the controversy around Orhan Pamuk and free speech issues in Turkey in general, and his winning of the Nobel Prize for Literature in 2006, it's probably fair to say he's one of the highest-profile writers from a Muslim country. As such, considering my studies, it was becoming a bit of an embarrassment to me that I still hadn't read any of his books. So I used our recent "Read a book from a country you haven't read a book from before" Challenge as an excuse to finally get around to it (I hope to still read a book by a lesser-known author from a lesser-known country at some point this year). Since I'd heard a lot of good things about My Name Is Red, and owned it besides (with thanks to Clover), that was the obvious choice. My Name Is Red is the story of a handful of artists in late 16th-century Istanbul, working as miniaturists for the Ottoman Sultan; as part of a centuries-old Islamic tradition of illustrating manuscripts for the personal collection of rulers. 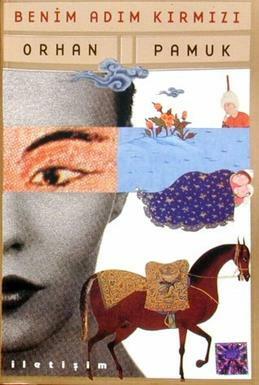 Since the depiction of human beings is something of a sensitive topic in Islam, this profession is rather more controversial and ideologically charged than one might think at first; and so the traditions guiding these men's every pencil stroke are careful to avoid certain traps, most notably the depiction of specific persons in such a way that they're recognizable at sight (by their looks, that is, and not merely by their clothes or attributes). When rumours start spreading that a wealthy art patron is preparing a special book for the Sultan, in the "Frankish" (i.e. European), heretic style, the lives of the miniaturists are no longer safe. In short, this novel is certainly an ambitious undertaking. Personally, I must admit I found it to fall short a bit. It's excellent in bringing Istanbul to life, and in describing the clash of the illustrating styles, with in the background the threat of the religious extremists who oppose all illustrations of humans (and coffee). This latter subject of course reminds one of comparable controversies in modern Turkey and the rest of the world, and comparable tensions between religious extremists and Western-influenced liberals. And Pamuk's language is quite up to the challenge of depicting the world through the eyes of professional artists, who find inspirations for their drawings in everything they see around them. Those qualities are, I think, more than sufficient to make My Name Is Red a good book and one that is highly recommended to anyone interested in the topics of art, religion, and the possible conflicts between the two. But to call a book truly great, it has to be successful in all of the goals it sets itself, be at least decent in all of its plotlines and elements. And I, at least, don't think that is the case here. The love story is never more than average, because neither of the characters involved is sufficiently well-developed to make things truly interesting. The detective story is given a lot of space for being as weak as it is. In a sense, it is merely a framework to hang the philosophizing about art on, as each of the suspects gives his own take on the meaning of real art and the question of whether it is desirable for a miniaturist to have his own style. But I don't know if that's a sufficient excuse, not when so much attention is devoted to it. For some reason, likely due to the detective story, I keep thinking about comparisons between this book and The Name of the Rose. And then I must conclude that My Name Is Red can't hold its own in that comparison; but then, few novels can. Coming second to The Name of the Rose is hardly a shame. I will freely admit I am left a little disappointed in this book; but since my expectations were very high, this doesn't stop me from warmly recommending it.